Abdulmohsen Abdulaziz Al-Babtain Co (AABC), the sole authorized dealer of Infiniti vehicles in the State of Kuwait is delighted to announce its first ever, biggest Leasing campaign. In a bid to enjoy the summer holidays with family and friends, the offer includes some of its acclaimed performance vehicles for all to enjoy the exquisite ride. Infiniti Al-Babtain guarantees attractive leasing prices in addition to a benefit package of free comprehensive insurance, maintenance and a replacement car that comes along with the leasing offer. Taking into consideration some of the best performance models in Kuwait, the Q30 that starts at a leasing amount of only KD 149 per month is Infiniti’s signature design, a premium compact vehicle that is popular among the younger drivers. Q30 comes with a double-arch grille with a unique 3D mesh and is powered by 1.6L or 2.0L Turbo engines in a 2WD configuration. For enthusiasts, the 2.0L Turbo is also offered with an optional AWD drivetrain. The 2.0L Turbo engine is a power- horse as it delivers 208hp and 350Nm torque while at peak performance, the INFINITI Q30 goes from 0-to-100kph in 7.3 seconds.A family-friendly, high performance car - the QX60 which is available at a starting amount of KD 275 per month, reflects the concept of high-end hybrid cars, and is designed to be a masterpiece of all standards. This innovative icon is equipped with a Rear Entertainment System with dual 8-inch monitors and wireless headphones followed by a 295-horsepower, 3.5-LITER V6 direct injection engine. From the double-arch grille to the LED taillights that accentuate the D-pillar, the confident curves captivate attention not usually given to a 7-passenger SUV. The QX70, also up for a special leasing price starting at KD 275 per month comes with exterior enhancements, LED daytime running lights along with unique 21x9.5-inch multi-spoke premium paint-finished aluminum-alloy wheels mounted with 265/45R21 V-rated all-season tires. 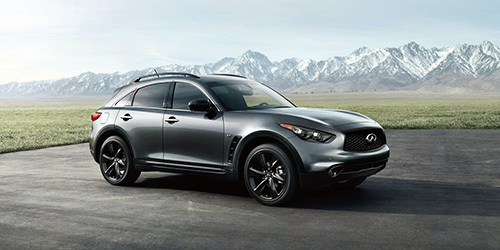 The QX70 is powered by a 329-horsepower 3.7-liter V6 with VVEL (Variable Valve Event & Lift). The engine is matched with a 7-speed automatic transmission featuring Adaptive Shift Control (ASC). Infiniti Al-Babtain invites its customers to avail of the first time limited duration deal at its showroom in Al-Rai. Al-Babtain Group was founded in 1948 to present a model of honesty, integrity and total dedication and to gain bright reputation in Kuwait and the Middle East area. Today Al-Babtain Group has licensing rights for some of the world’s leading brands stretching the globe from the USA to the Far East. For 70 years Al-Babtain Group has experienced continued success, and large measure of this success came from the Group’s advanced flexible management style and long term vision. Theseastounding results were achieved due to a versatile strategic formula focusing on growth amongst its sphere of activities; including automotive, technology, investment, information, industrial and Finance. The automotive sector is the main structure of the Al-Babtain Group’s business, which owns some of the best-selling and demanded brands in Kuwait, in addition to heavy equipments. The Abdulmohsen Abdulaziz Al-Babtain Co and Trading and Contracting Company is proud to be the authorized agent and distributor of many Japanese, Chinese, and European (French) vehicles in Kuwait such as Nissan, Infiniti, Renault, Citroen.